Photo courtesy SeaArk Marine, Inc.
SeaArk Marine, Inc. has delivered a 30-ft Enforcer Series all-welded aluminum fire/rescue boat to the Guntersville, Ala. Fire Department. The boat features a modified vee, constant deadrise hull that produces a smooth, dry and stable ride. These characteristics were given a high priority by the Guntersville Fire Department in order to ensure required fast response times, capability for all-weather fire fighting and maneuvering on-station requirements were met. The boat is tasked for fire/rescue/recovery missions on Lake Guntersville (69,000 acre lake) and the Tennessee River. 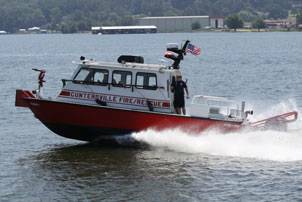 In order to facilitate quick response time in getting on scene, the Guntersville Fire Department selected twin 250 horse power, four-stroke, Yamaha outboard engines mounted on an integrated motor mounting platform surrounded by a heavy-duty outboard protection bar. For rescue calls, the boat includes a 12-ft cabin with treatment benches located on both port and starboard sides where victims can be treated and stabilized while enroute to a shoreside facility. Storage compartments/shelving is provided under each treatment bench for easy access to EMT equipment and supplies. For fire calls, a Hale 1,500 gpm pump at 150 psi connected to a Marine Power, E5.7V-MR2 fuel injected, V-8 engine is installed below the main deck. Hinged access hatches provided easy access to the pump assembly. Suction for the fire pump is through a 6-inch hard piped thru-hull suction line. Discharge hard piping is provided from the pump to a remote controlled Akron bow monitor with fog nozzle and stream shaper mounted on the foredeck. A 5-inch Stortz fitting is installed in the monitor stack and an additional 5” Stortz fitting with swivel elbow is located on the starboard side, aft by the transom. A 1-1/2” gated wye is installed port side aft by the transom for connection of hand lines. The fire pump control panel with gauges, vernier throttle control and joy stick for the monitor is located in the port side dash inside the cabin. A 40 gallon Darley-around-the-pump foam system is also included. Cabin air conditioning and heating is provided by a roof mounted 15,000BTU A/C unit with heat strips. Additional ventilation is provided by two oscillating fans mounted in the overhead above the operator and companion seats. An easy-access, full-width transom locker provides access to batteries, battery selector switch and battery charger. AC electrical power is provided by a 5.0kw Kohler, water cooled generator mounted below the main deck. A cuddy cabin is provided under the foredeck for storage of firefighting equipment including air tanks. The boat is also outfitted with a Raymarine VHF, DSC marine radio; Motorola CDM 1250 radio; Whelen lightbar; siren/hailer; below deck FE-241 fire extinguishing system; push knees; fire hose storage boxes; electric/pneumatic pilot and companion seats; Garmin 36nm GMR 18, 36NM, digital radar; GPSMAP 4212 network plotter; Hummingbird 1197C NVB sonar and 30 amp shore power system. • Yamaha • Garmin • SeaArk Marine Inc.